Saturday, November 1, 2014. Here is my first post as part of the National Blog Posting Month challenge. For me, it will be a challenge to post every day of the month. Fingers-crossed, folks. 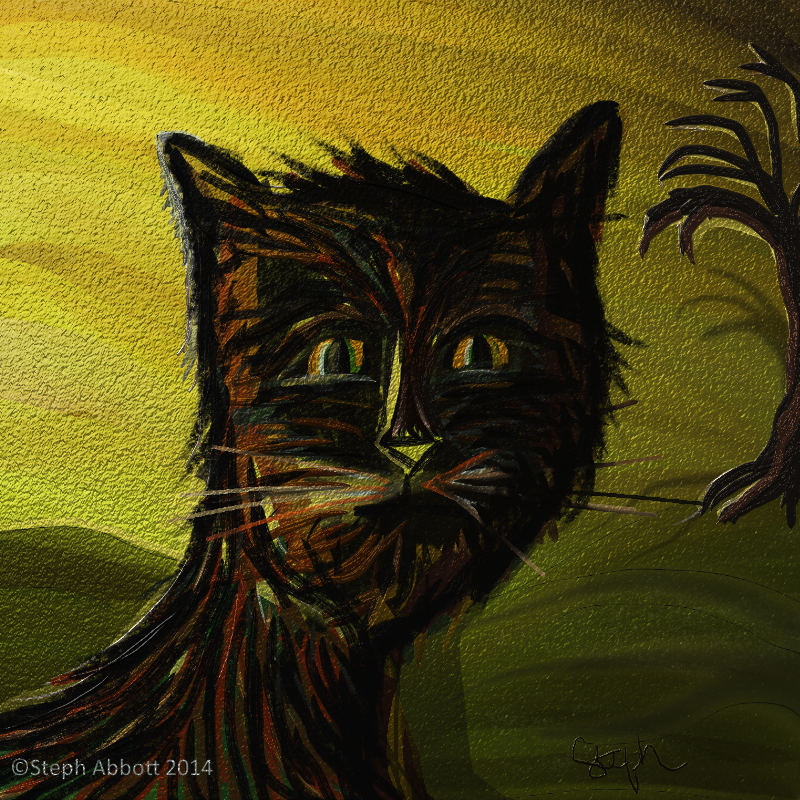 Inspired by Halloween and the turning of the seasons, I created the image of the witch’s familiar using Art Rage 4 software. Thinking of the day after Halloween as All Saints Day, I then wrote the corresponding haiku, Familiar Meow. I see you have trouble posting regularly as well. 😉 Hope you have a good NaBloPoMo. Here’s to posting every day! I need a challenge once in a while. Thanks and cheers too, Narmadhaa! Tempting as it is to join you, practical reasons forbid me from committing myself to blogging every day. I have a close relative who is unwell and who insists on my going over to be with now and then besides having to make a trip up North to be with some other friends who too need some company for very personal reasons. I however wish you all the best and look forward to seeing all your posts. Well, Ramana, at least your posts are more frequent (and longer) than my mine. It will be a great challenge for me to post daily. I can barely do it quarterly. Safe travels and best wishes for your relative’s health, dear sir.